What are the causes and effects of ENSO? 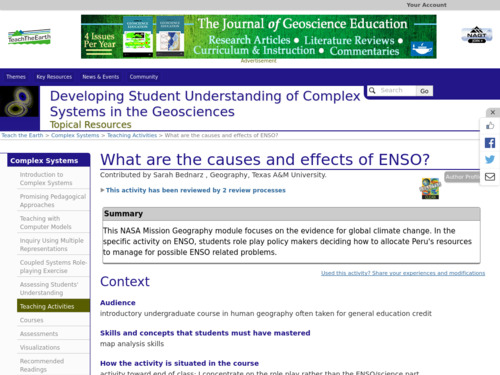 This activity addresses naturally occurring climate change involving ENSO (El-NiÃo Southern Oscillation). In this activity, students play the role of a policy maker in Peru. First, they determine what sort of ENSO variation is occurring. Then, they must decide how to allocate Peru's resources to manage for possible weather-related problems.